Visual Studio Code>Other>Insert UnicodeNew to Visual Studio Code? Get it now. Search for unicode characters and insert them into documents. This is an extension for Visual Studio Code which adds commands for inserting Unicode characters/codes and Emoji. There are commands for inserting Unicode characters as text or as hex codes. There are variations for both commands that search for an exact name rather than a substring to facilitate faster insertion when the name is known. Inserting/Replacing Text With a "Unicode Font"
This command inserts/replaces Latin alphabetic characters with unicode variations that give them another appearance. Whether these characters can be displayed properly depends on the font, of course. This command will show the Unicode name and code point of the selected characters. Note that joint characters are split up in the analysis. If you happen to know the exact code, the command Insert Unicode from Hex Code can be used. Some of "fonts" do not convert correctly. 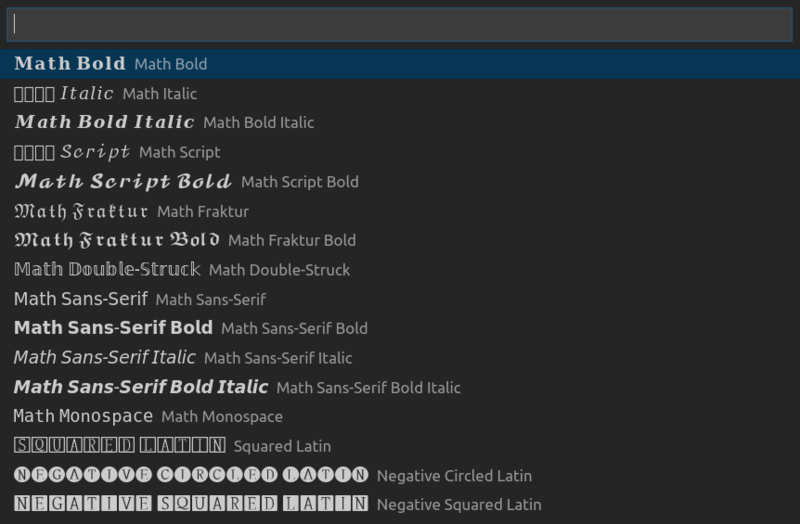 The unicode fonts may confuse word wrapping, which is an issue on the side of VS Code itself. Are you a fan of Unicode? There is a program to adopt a Unicode character whose donations are used to preserve the linguistic heritage of the world. I think it would be nice to jointly adopt a character at the silver level as the users of this extension. To that end I will now accept donations; it would only take 100 people to donate $10 to reach the target of $1000. Personally, I am a great fan of ✨, so that is my proposed character of choice. Note: I will keep donations open for at least one year starting with the Unicode v.12 release () on 2019-03-05. Donations will not be refundable. If reaching the target appears to be unfeasible at any point after the elapsed year, the donations may be given to another charitable cause!